There is something special about Sleepy. He has the amazing patterns of stripes, ticking and spots that make a tiger kitten such a delightful work of art. He is the ideal kitten to adopt during Urbana’s Art Affair on the Square. Drop by Paws Animal Shelter during the local art festival on Saturday, July 1h. Meet Sleepy and the other colorful cats and dogs up for adoption. Sleepy is a handsome fellow. You will have a pal for life if you adopt this wonderful kitten. His mother had seven kittens soon after she arrived at Paws. All her kittens were named after the Seven Dwarfs. Sleepy is a quiet, fun loving boy. Sleepy would like nothing better than to come home with you and curl up with you as you watch TV or read a book. He has a wonderful personality and likes to play with his brother, Dopey. He is litter box trained. Sleepy will have his shots and a neuter certificate when adopted. Open your heart and home to this sweet boy. He will leave paw prints on your heart! Stop by Paws Animal Shelter, located at 1535 West US Highway 36, Urbana, Ohio 43078, or call Paws Animal Shelter at 937-653-6233. The Shelter hours are Tuesday-Friday 12-5 p.m., Saturday 12-4 p.m., Sunday and Monday-closed. There are many wonderful cats, adorable kittens and fun-loving dogs at the shelter waiting for good homes. Paws Animal Shelter has a lot of kittens and cats to feed and is in need donations of Purina Kitten Chow and Purina Complete Cat Chow. Currently we have enough Purina dog chow thanks to generous food donations. We also could use donations of bleach, laundry detergent and clumping cat litter. Paws Animal Shelter is a no kill shelter. We are a nonprofit organization that operates only by donations. We do not receive any city, county or state funding. We depend on public donations and our adoption fees to run the shelter. Please consider making a donation to help fund our shelter. We are always looking for volunteers to come to the shelter and help out. You could play with the cats or dogs to help socialize them. There are many small jobs that a volunteer could do. We also need volunteers to foster cats, kittens, dogs or puppies. https://www.urbanacitizen.com/wp-content/uploads/sites/36/2015/07/web1_paws-kitten-cat-Sleepy-July-3-2015-900.jpgThere is something special about Sleepy. He has the amazing patterns of stripes, ticking and spots that make a tiger kitten such a delightful work of art. 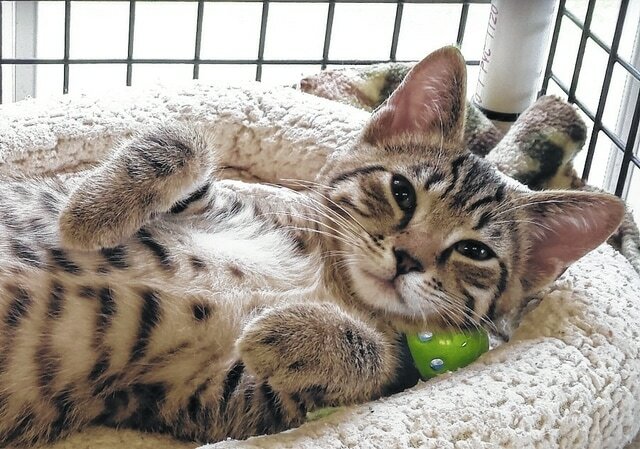 He is the ideal kitten to adopt during Urbana’s Art Affair on the Square. Drop by Paws Animal Shelter during the local art festival on Saturday, July 1h. Meet Sleepy and the other colorful cats and dogs up for adoption. Sleepy is a handsome fellow. You will have a pal for life if you adopt this wonderful kitten. His mother had seven kittens soon after she arrived at Paws. All her kittens were named after the Seven Dwarfs. Sleepy is a quiet, fun loving boy. Sleepy would like nothing better than to come home with you and curl up with you as you watch TV or read a book. He has a wonderful personality and likes to play with his brother, Dopey. He is litter box trained. Sleepy will have his shots and a neuter certificate when adopted. Open your heart and home to this sweet boy. He will leave paw prints on your heart! Stop by Paws Animal Shelter, located at 1535 West US Highway 36, Urbana, Ohio 43078, or call Paws Animal Shelter at 937-653-6233. The Shelter hours are Tuesday-Friday 12-5 p.m., Saturday 12-4 p.m., Sunday and Monday-closed. There are many wonderful cats, adorable kittens and fun-loving dogs at the shelter waiting for good homes. Paws Animal Shelter has a lot of kittens and cats to feed and is in need donations of Purina Kitten Chow and Purina Complete Cat Chow. Currently we have enough Purina dog chow thanks to generous food donations. We also could use donations of bleach, laundry detergent and clumping cat litter. Paws Animal Shelter is a no kill shelter. We are a nonprofit organization that operates only by donations. We do not receive any city, county or state funding. We depend on public donations and our adoption fees to run the shelter. Please consider making a donation to help fund our shelter. We are always looking for volunteers to come to the shelter and help out. You could play with the cats or dogs to help socialize them. There are many small jobs that a volunteer could do. We also need volunteers to foster cats, kittens, dogs or puppies.